This week's challenge was Catalog Inspiration. I knew as soon as I heard what the challenge is, that I wanted to share my Pottery Barn-inspired chalkboard with you all. I have been wanting one of those huge chalkboards in the Pottery Barn Catalog for ages! Trouble is, I didn't want to spend the $149 it was going to cost to buy one. So what's a frugal OCD (Obsessively Consumed with Decorating) girl to do? Why, make one of course! So with a little help from the Hubby, I made my own chalkboard. All it took was a 4x4 piece of underlayment (readily available at your local big box hardware store), some 1x3's, nails, wood glue and some chalkboard paint. Pretty soon we had ourselves one of these. You can read more about how we created it here. 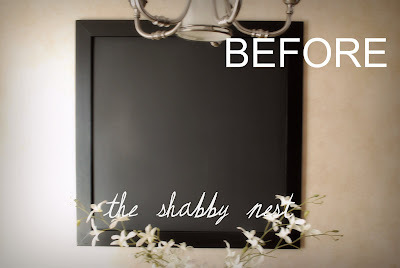 Of course, a Pottery Barn-inspired chalkboard deserves a Pottery Barn-inspired setting in which to dwell. So I set about creating one. And here is what I came up with. 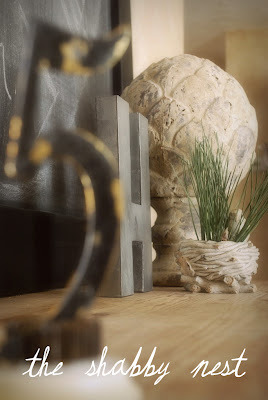 I decided to use a rustic wood console table as the basis for my vignette. It's similar to one I've seen in the PB catalog, and it was approximately the same width as the chalkboard so I knew it would work perfectly. After I had the table and chalkboard in place, it was time for the accessories. I chose to use a pineapple garden finial and a tall topiary as the basis for my tabletop accessories. I then added in a galvanized letter H (from Anthropologie), a small cement nest (holding another bit of green to echo the green in the topiary) and an old house number nestled in the prongs of a vintage floral frog. 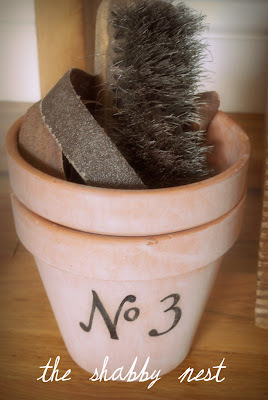 I also added these cute terracotta pots filled with an old wire brush and sandpaper belt strips (sounds strange I know, but it looks perfect!) The pots were new when I purchased them. Too new. So I gave them a patina by brushing a wash of cream and burnt umber acrylic paint mixed with water over each of them. I then painted the "No. 3" on the front of one of the pots for a little interest - and because I just can't resist the urge to number things as evidenced here. Finally, here is a great trick if you lack wall space OR if, like me, you just simply have too many wonderful pieces of art, and want to rotate them a bit. 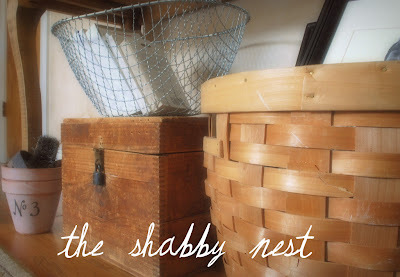 Borrowing another decorating trick I have seen in PB catalogs, I simply placed a couple of framed pieces of art in a big basket. 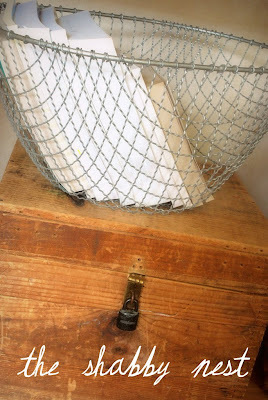 The photos (at least the top one) are still visible in the basket, and the black frames echo the black in the chalkboard to create a sense of balance. I just love how it all turned out. This is the BEST submission (and of course I already voted.) LOVE IT!!!!!!!!!! 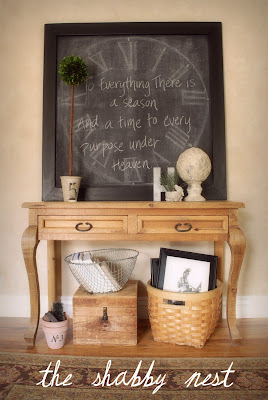 Love the chalkboard and the chalk-drawn clock.. cute! That chalkboard is stunning! The arrangement is very PB. Great job! Love the Chalkboard. Great job! You know how I love chalkboards...this one is great! It's all super fabulous! Love all the touches...from the 5 in the floral frog to the sandpaper in the terra cottag pot. Where did you get the super tall topiary? I'm totally a chalkboard junkie...they're all over my house! Love yours, and the fabulous way you display it. Simply lovely! You did a great job. Amazing entry, Wendy! Love all the touches around the chalkboard as well. Lovely! Wow! Fantastic! I am headed over to vote right now. I love how you drew that clock and then made it the background for your scripture. That is awesome. I also love the color tie-ins with the 2 greens and how you added a little bit of black under the table to related to the chalk board. Awesome. Amazing job! You got my vote! I love this! You are so talented, and I'm loving your style. Wow! This is amazing! I had to do a double take, I thought it was an actual photo from PB! I love it Wendy! It looks fantastic! You bet I'll vote. You are brilliant! The chalk-clock is an idea I'm snitching. Love the chalkboard! But I also love the console table and I am looking for one where did you find it? Looks great bt how in the world do you keep your kids from distroying it or the house with it (ie wire brush)???? My two year old would ruin the floors walls maybe even the fridge with that baby. Oh Wendy I have a living room that needs your help... i've got the spring bug to give it a good switcheroo!!! Your whole vingette looks amazing!!! I really love the way you styled this. And that clock you drew on your chalkboard is the best!